NetSuite is the #1 Cloud ERP platform in the world. With all its power and capabilities, you need to ensure it’s performing the way your users—and customers—need. That’s where Luxent can make the difference in helping you maximize your NetSuite platform and see greater ROI from your technology investment. 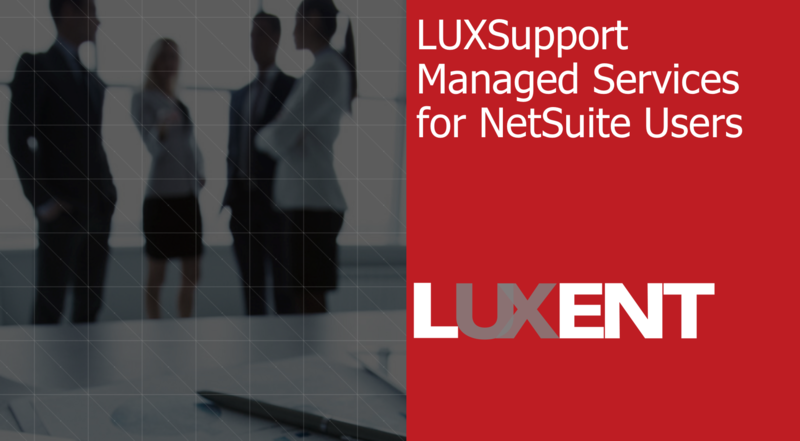 LUXSupport Managed Services for NetSuite from Luxent provide comprehensive support to keep your NetSuite platform running smoothly, support your users, and help you gain measurable benefit from your system. The Luxent difference is based on our belief that great services come from great relationships. To support that belief, every level of LUXSupport Managed Services for NetSuite comes with a designated account manager who knows you, your business, and your NetSuite setup. Learn more about our LUXSupport Managed Services for NetSuite packages below, including an option to completely customize your support experience. “The Luxent team took ownership of getting our issues resolved. When an issue required in-depth analysis, Luxent conducted the necessary analysis and delivered a resolution so that the Peerless team could focus on the needs of the business. Ross Sivertsen, Director of Technology Services Peerless Mfg. Co.